Now that I have begun collecting materials for the Indian Epics UnTextbook, I needed a place to do that, and the Indian Epics Resources blog is already up and running: perfect! I can use the power of the blog labels, blog comments, and RSS to use this as an interactive space where I can curate these public domain books together with the students! Current contents of the blog. I had created that blog in summer 2014 in order to relocate the Reading Guides for the books to a space that was easier to maintain and update than my old website; the Storytelling Prompts for the books are also there at the blog. Mainly, though, I have been using this blog space to start building an image library, with each image having its own blog post; there are about 500 images there now. Building a Library at the blog. What I will be doing at the blog now is building a library of online, full-text books that are relevant to the class; these books are also the candidates for inclusion in the UnTextbook. Eventually, I will also add reference books and other useful online references and resources, but for now the focus is on the full-text literature books that could go into the Untextbook: Indian Online Books Library. That index page will, in turn, link to individual posts for each book, as in this example: Indian Idylls of the Mahabharata by Edwin Arnold. Students as curators. What I am really excited about is that this will allow the students to get involved in reviewing these materials; that would have been such a big plus for the Myth-Folklore UnTextbook, but I did not have as much lead time. The way that will work is that I will offer the students in both classes an extra credit option for reviewing the materials that look to me likely to be useful as new India units in the Myth-Folklore UnTextbook and/or as units specifically for the Indian Epics UnTextbook. I will flag the book pages with the appropriate label for likely candidates: Myth-Folklore and Indian Epics. 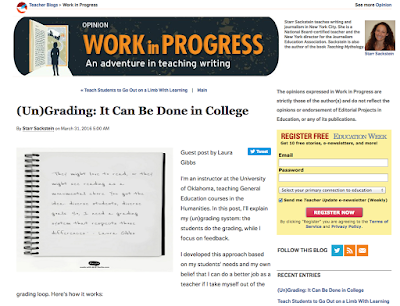 Then, students who want to participate in the review process will be able to browse those the labeled posts, find something that grabs their interest, do some reading, and leave comments at the blog.